You’ll never go back to regular frozen veggie burgers after you try this recipe. 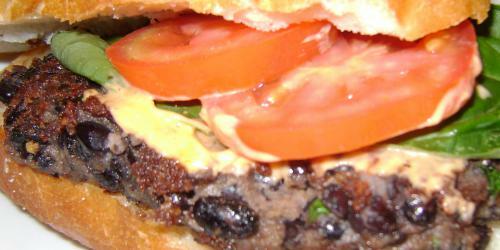 As you can probably tell from our previous recipes, we LOVE black beans. They’re low in fat, high in fiber and protein…and inexpensive—even if you buy organic. Make extra aioli to perk up sandwiches or french fries. 1 teaspoon ground cumin $2.50 for 1 oz. In a small bowl, smash half of the beans with the back of a fork along with 2 tbsp of the mayonnaise, the bread crumbs, cumin, salt and pepper until well-incorporated. Transfer to a bowl and stir in cilantro or parsley and remaining beans. Form mixture into 2 patties. Heat the olive oil in a medium skillet over medium-high heat. Cook burgers until outsides are crisp, about 3 minutes per side. To make the Sriracha aioli, mix 1 tsp Sriracha with 2 tbsp mayonnaise. Stir well to incorporate. To serve, split rolls in half and place burger on the bottom half. Top with a layer of the aioli and your favorite burger toppings (avocado, cheese, onions, tomato, etc). Delicious, cheap eats! Gotta love it. Loved this burger! Really good topped with fresh sprouts, avocado and provolone cheese. :) Thanks for the recipe. thanks for sharing the valuable post. I always delight in discovering a website that provides great info considered that I such as identifying intriguing points. Delighted that I discovered your website thought about that I actually appreciated it and also I additionally expect your future write-up. I celebrate I revealed this website. I could not discover any kind of type of type of understanding of this problem before. Also, run an internet site along with if you are ever before considering doing some site visitor writing for me ideally do not wait to allow me to acknowledge.